The meteor was recorded at approximately 10:34:16 UTC in an allsky camera at the Marshall Space Flight Center. Stargazers around the world are hoping for clear skies when the first meteor shower of 2013 peaks tonight, but if foul weather does spoil your view, don't fret. You can also track the meteor shower online. NASA scientists at the Marshall Space Flight Center in Huntsville, Ala., will provide a live webcast of the Quadrantid meteor shower tonight through Friday (Jan. 2 to 4), to capture the peak of the annual "shooting stars" display. 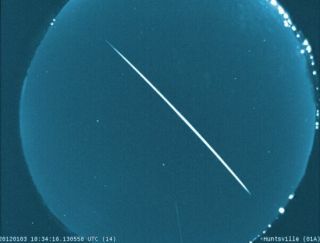 You can watch the meteor shower on SPACE.com here, courtesy of NASA's webcast. "Peaking in the wee morning hours of Jan. 3, the Quadrantids have a maximum rate of about 80 per hour, varying between 60-200," Marshall center officials explained in an announcement. "Unfortunately, light from a waning gibbous moon will wash out many Quadrantids, cutting down on the number of meteors seen by skywatchers." The Quadrantid meteor shower occurs every year in early January when the Earth passes through a stream of dusty debris cast off by the asteroid 2003 EH1, a space rock that astronomers suspect is actually a chunk of a centuries-dead comet. The shower appears to originate in the eastern sky from the outdated constellation called Quadrans, which is located near the northern tip of the constellation Bootes, the Herdsman, NASA officials said. This NASA map depicts the locations on Earth where the 2013 Quadrantid meteor shower will be visible in early January 2013. Green areas denote good viewing areas, yellow marks poor visibility and red denotes regions where the shower will likely not be visible. According to NASA, the Quadrantids will peak between midnight and 3 a.m. (your local time), with the best views expected for stargazers in the Northern Hemisphere, though the display should be visible from anywhere on Earth north of the latitude 51 degrees south. "To view Quadrantids, go outside and allow your eyes 30-45 minutes to adjust to the dark. Look straight up, allowing your eyes to take in as much of the sky as possible," NASA officials advised. "You will need cloudless, dark skies away from city lights to see the shower." Dress warmly: Since the best sky show will be in the Northern Hemisphere, where winter is in full swing, you will want to wear extra layers to ward off the chill during your observing period. Get comfortable: A comfy reclining outdoor chair or blanket may be just the ticket for a long night of meteor-watching. Your neck will thank you in the morning. Look straight up: NASA scientists have said the best way to watch a meteor shower is not to strain your eyes at the shower's radiant — the patch of the sky where it appears to emanate from. Looking straight up is the best method to see any meteors or fireballs during the night. Follow SPACE.com @Spacedotcom. We're also on Facebook & Google+.